As the northeast continues to get pummeled by snow, it’s hard not to think about the infamous snow plow wars waged between Homer and Barney Gumble in “Mr. 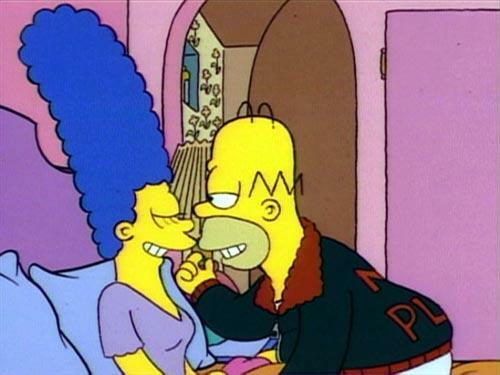 Plow,” a fourth-season episode of The Simpsons. Homer does, however, admit his stupidity to Marge—“If you’re gonna yell at me every time I do something stupid, then I guess I’ll just have to stop doing stupid things!”—right before he walks into the open door of his new plow. SIMPSONS CLASSICS Keep up with Tim’s ongoing look into the funniest and most groundbreaking episodes of one of television’s landmark series. *The episode also shows Homer introducing Barney to beer the night before the SATs and, presumably, ruining Barney’s life. I’ve never really liked this flashback because the Barney solving those practice test analogies would probably never hang out with the high school Homer established in other episodes (and shown in this very flashback). That’s what makes Barney’s theft of Homer’s idea such a betrayal and helps, somewhat, explain Homer’s harsh reaction that almost kills his friend. After all, Homer’s plan isn’t to hurt Barney; it’s just to ruin his day and exploit his absence for his own financial windfall. *In the past, I’ve been critical of guest stars playing themselves on The Simpsons. Here’s two counterexamples, where both West and Ronstadt were great secondary pieces to the main plot, ranging from West’s take on the modern Batman (“How come Batman doesn’t dance anymore?”) and Ronstadt’s jingles for the Plow King (and that she and Barney “had been looking for a project to do together”). “Mr. Plow” further includes some very good references, highlighted by Bart being pummeled by snowballs Sonny Corleone-style and Kent Brockman revealing the news of Barney’s being trapped just like Walter Kronkite did when he learned JFK had died. Moe’s line about the Iranian hostages (“Ehh, they shouldn’t’ve been there in the first place”) is another that gets me every time. “Mr. Plow” may not be one of the most realistic episode of The Simpsons, but it’s real enough in its portrayal of Homer’s one true friendship to complement some of its most hilarious scenes. On another snowy February day, it’s nice to sit back and call Mr. Plow, that’s his name, that name again is Mr. Plow.